EBENEZER BAIN, born on the 28th of February, 1838 at 9 St. James Place, Edinburgh, was one of five children born to Thomas Bain [Custom House Officer] (1813, Forres-1892, Forres) and Jessie Russell (1811, Knockando -1875, Leith). Thomas Bain, Ebenezer’s father, was one of fourteen children born to John Bain [Shoemaker] (1875, Forres-1855, Forres) and Jane Brander (1778, Elgin-1835, Forres). John Bain, Ebenezer’s grandfather, was one of three children born to Alexander Bain (Shoemaker) and Emelia Jenkins, both of Forres, who married there on the 12th of March, 1767. In the 1861 Scottish Census, Ebenezer is seen to be employed as a Tinsmith in Edinburgh, but in 1863 he emigrated to Montreal, Canada, where, in 1865, he married a Margaret Adamson who had been born in Peebles on the 31st of October, 1838 to James Adamson [Quay Porter in Leith] (1794, Stobo-1875, Edinburgh) and Margaret Smeal (1810, Peebles-1869, Leith). However, it is clear that Ebenezer and Margaret had met in Leith prior to her subsequent emigration to Montreal in 1865, as the Adamson family had moved from Peebles to Leith around 1840. Margaret Adamson’s grandparents were William Adamson [Farmer] and Jane Baird; and, William Smail (Merchant) and Agnes Wilkie - all four from Peebles. Margaret Smeal Bain -1 May 1866 – died 18 May 1956, Montreal. Henry Russell Bain – 10 May 1871 – died 18 April 1947, Ottawa. Alan Stanley Bain – 20 December 1872 – died 9 November 1954, Montreal. Alexander (Sandy) Stevenson Bain – 28 November 1874 – Vancouver, date unknown. Archibald Douglas Bain – 2 February 1877 – died 1950, Winnipeg, Manitoba. James Tweed (Jack) Bain – 3 May 1879 – Montreal, date unknown. Robert Gordon Bain - 24th November 1882 – died 8 December 1964, Montreal. 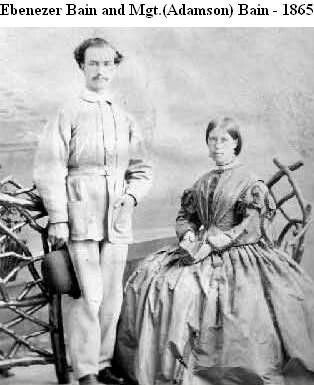 Ebenezer and Margaret raised their family at a house in Cadieux Street in Montreal. The name of Cadieux Street was changed during the nineteen-thirties, but a house of the type they had in that location still stands at 3460 de Bullion Street. Ebenezer worked for a time with a firm of plumbing wholesalers in Montreal, and then spent forty years in the insurance business. He served with the Montreal Garrison Artillery for five years, and was present with them when the ‘Fenian’ raid at Trout River, near Huntingdon, Quebec, was repelled in 1870. He took a keen interest in the Caledonian Society of Montreal, and his recital of Rabbie Burns' "Tam O' Shanter" at a family Christmas party, when he was eighty-eight, is remembered as an outstanding occasion. He also enjoyed writing poetry, and some of these efforts appeared in the Montreal press from time to time. Then, later, a collection from his verses, "Ramblings in Rhymeland", was published in 1918 to mark his upcoming eighty-first birthday in 1919. It is a small volume of just over one hundred pages of delightfully unpretentious poems and song lyrics; and it also contains four photographs, including one of himself and a much beloved grand-daughter, Molly. 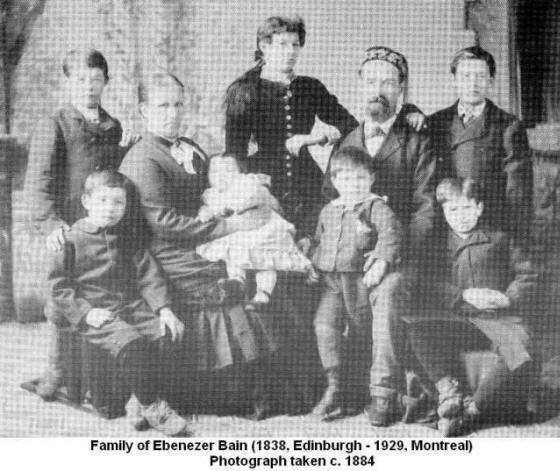 Ebenezer Bain died in Montreal on October 7, 1929, in his ninety-second year. DEDICATED TO MY RELATIVES AND FRIENDS AND ALL LOVERS OF TRUTH, NATURE, BEAUTY, HARMONY AND HUMANITY. I beg to tender my sincere thanks to such kind friends as the Hon. R. S. Weir, Messrs. W. D. Lighthall, Harcourt Farmer, William Drysdale and T. H. Warren, for their valuable assistance and counsel in the preparation of these selections for the press. THE author thinks that a long introduction to this small volume of poems would be much out of place; therefore will, with the kind reader's indulgence, briefly recount in explanation apology, if you will the circumstances attending its publication. That one now over eighty years of age should venture, for the first time, to launch a book, and more especially a book of poems, and the further fact that he had reached the half- century mark before sending his first contribution to the press, seems like flying in the face of the famous dictum of that eminent man, Professor Osier. I must confess that the dominant feeling that suggested offering my poems in book form (a feeling I believe shared by many who, like myself, have devoted much of their time to the Muse) was a reluctance to consign to oblivion what I had come to consider my progeny. Notwithstanding this feeling, I had abandoned the idea of publishing, and had consigned my manuscripts to my son's care, with instructions concerning them. And it was only recently, at the request and promptings of several friends, and letters from persons I had never seen, but who had read some of my contributions in the papers and thanked me for the pleasure they had obtained in the perusal of my verses, that I felt impelled to reconsider my original intention. These, then, are the motives that have prompted me to issue this little book, in which I am cognizant of many infirmities, and as being in my own estimation simply "ramblings" in various by-ways of "rhymeland." And good a child or rose to look upon. And kindness cheering like Falernian wine. While still beyond the stars eternal burned. 07 “Peace Without Victory.. Never"
53 Sing the "Auld Scots Sangs"
59 English or British which?. . .